In 2013, the television anime "Astro Boy" [Tetsuwan Atomu], which played an epoch-making role in Japanese anime history, is celebrating the 50th anniversary of its first broadcast. The 50th anniversary will be commemorated this year with the following schedule. First, in February, the major cable company Family Gekijo will present an Osamu Tezuka special, and in March it will feature the 50th anniversary of "Astro Boy". There will be two special programs that will focus on Tezuka's anime. Family Gekijo has produced its own special program, "The Manga God: the History of Japanese Television Anime Creation," a 30-minute documentary that explores the birth of anime in Japan. The basis of Osamu Tezuka's anime will be explored, as far back as the experiences he had in his childhood. Anime supervisor Daisaku Shirakawa, animation history researcher Nobuyuki Tsugata, and Eichi Yamakawa, the first producer at Toei Animation, will be interviewed. The program is planned for March 10. Also, "The Manga God: Phoenix Reincarnated" will air on February 17. These are the same original Family Gekijo programs that aired in 2012, in which Osamu Tezuka can also be spotted. In February, Tezuka's special collection, "Black Jack", "Phoenix Houou [Mythical] Hen", "Phoenix Yamato-Hen", "Phoenix Uchu [Space] Hen", "One Million-Year Trip: Bander Book" [Hyaku-man nen chikyu no tabi banda bukku], "Undersea Super Train: Marine Express" [Kaitei choutokkyuu Marine Express], and "Three-Eyed One" [Mitsume ga touru] will be broadcast. 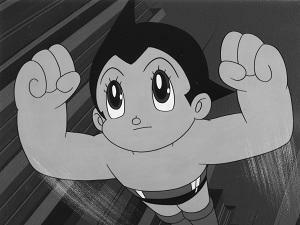 In March, the HD remastered "Astro Boy" will be shown on television for the first time. "W3", "Vampire" [Banpaiya], "Adventures of Goku" [Goku no daibouken], and "Dororo" are the television anime masterpieces that will be shown from that period. Starting March 2, "Osamu Tezuka Gekijo" will be a regular feature every Saturday at 8:00, a powerful push of the Tezuka and Atom 50th anniversary. Astro Boy! Full of memories!